Dimensions: 17 3/4" x 14 1/2"
Personalized golf towels make a practical and stylish gift for friends, family, coworkers, and mor3. 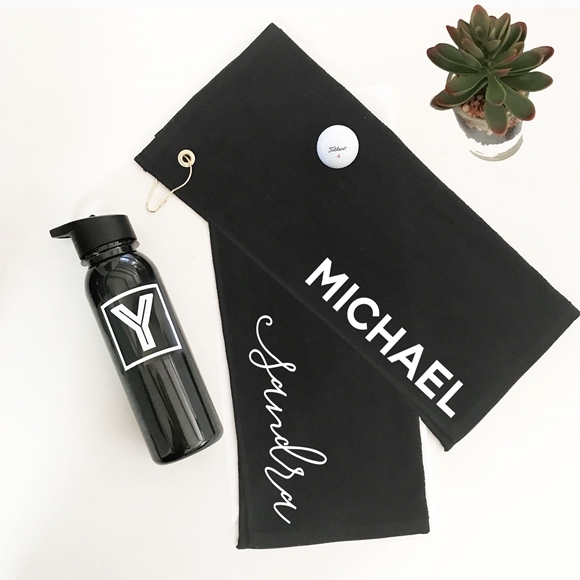 Each 100% cotton towel comes in black with a gold ring for hanging and may be personalized with the name of your choice in white. Choose from or modern block font or a contemporary script font for a completely personalized look. PLEASE NOTE: Sold individually. Pictured plant, golf ball and tumbler are not included.